Anthony Bourdain Was In Manila and I Didn’t Even Know It ! Anthony Bourdain of “No Reservations” fame was in Manila to film his show and I wasn’t even aware of it until weeks after he left. My wife knew, but didn’t say a word, not knowing or caring who Mr. Bourdain was. As always, I found out first from the blogs, notably marketmanila.com and food-stylingmanila.com. 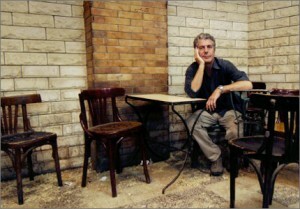 I was on the verge of tears and dying of envy of everyone who had a chance to interact with the Great Bourdain. Needless to say, I’m a huge fan of the show and when I got a copy of “No Reservations” the book, around this time last year, and saw that he had never been to the Philippines, I knew that it was only a matter of time before he landed on our fair shores and sampled our unique cuisine. Well it happened, and he and his crew went in and out the country like ninjas, stealthily but effectively. They had no choice, I suppose, as the resulting media frenzy would have kept him from sampling the authentic grub which was their real objective. And they did their homework, zeroing in on the authoritative people who could give them a broad sampling of honest Filipino cooking at its best during their short stay. Guys like Market Man, Claude Tayag and Gene Gonzales. He was rightfully dismissive of balut, calling it “so last week”. But he appears to have enjoyed all the other dishes brought his way, and this will undoubtedly be a classic segment no one will want to miss. The next best thing to being there is reading about it in the blogs of Market Man and Anton Diaz. And here’s the video made by Augusto from Long Island, New York entitled “Philippines: Manila & Cebu” — one of the finalists for the Bourdain FAN-atic contest, with its mouthwatering visuals which enticed Bourdain to come to the country. And he might yet return, since I heard he and his family are thinking of settling down in neighboring Vietnam. What’s Behind Obama’s Snub of President Arroyo ?